Those crazy programmers over at the Willow Garage are at it again. 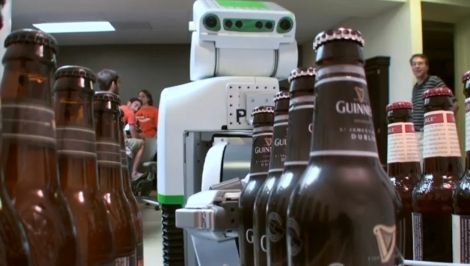 This time around they’ve created a robotic wench to deliver the beer. When thirst strikes you can fire up a web interface and drag a picture of your beer into a shopping basket. Once you submit your order the bot will raid the fridge and return with your frothy treat. It will even open the bottle for you but, as you can see after the break, this is where your beer becomes truly frothy. So we’ve seen the PR2 playing pool, and now as a barmaid. 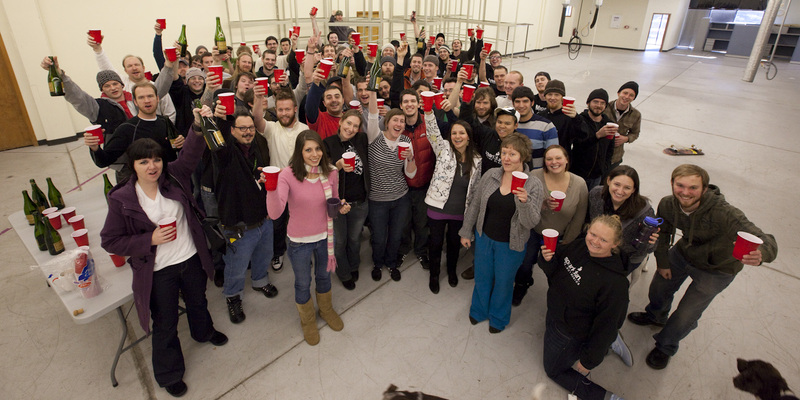 Willow Garage just joined SparkFun on our list of places we wish we worked. Two out of the four beer selections are made in Oregon! Where’s the web interface!? I want it to bring ME a beer. Now if only you could speed it up a little. Seems like the beer might be kinda warm by the time it gets it to you. I came to post the same thing! :-P Gotta love Oregon (and pretty much all West Coast) beers. Beer is among the banes of human existence. It made living in Oregon smell terrible. It made living in Oregon boring because people were drunk and stupid. It makes being around cars more dangerous because people drive drunk. Granted, it is all a choice, and really those choices are the bane. For some reason that I cannot fathom, beer has become an acceptable choice. Absolutely disgusting. Cool robot, wish it would bring me a mask to guard from the horrid beer smell. Have you considered it might not be the beer, it might be Oregon? Those are cool bots but, why are they so slow? More seriously – Yes. I have been forced to consider the ramifications of alcohol consumption _everywhere_ I’ve gone. It’s definitely not specific to Oregon. I’ve lived in every part of Oregon where it smells like cow crap, paper mills, metals factories, onions, potatoes, hell even hop farms and I’ve NEVER heard somebody describe any city as smelling like beer. o_0 Where the HELL did you live??? @Ezekiel: Troll much? Ya know… I drink various forms of alcohol, and make it too. I have never had liver failure, never been yellow, never driven drunk, never been injured because of the drink, and rarely have I drank to excess. I recognize there are many folks out there who may have a different experience. The bane is not alcohol… its lack of self control, and people who cant tell the difference between an inanimate object and a person making poor decisions. Although I’m not a beer drinker(give me a good Merlot), I think this is a fantastic project. Reminds me of the movie, Wall-E, where the robots serve the guests and they just sit around and get fat. Ezekiel: you need a history lesson, the human race survived largely in part to beer, during the middle ages, when water purity couldn’t be tested like today, the beer making process destroyed harmful bacteria and sanitized a liquid which, at the time, had a more significant nutritional value to it. remember, drinking, living in oregon, these are all choices, let people make their own choices. as for the article, love it, a friend of mine works in Indiana, but logs on to a remote at willow, I hope he has fun with this, shakes a beer or two then puts it back. So Willow Garage pays its programmers and engineers to program robots that perform mundane tasks like getting you drunk and playing pool an even lazier task? Cool stuff, don’t get me wrong…but an actual legitimate business pays its employees for this crap? want one…….. willing to pay 2.5 million….. oxygen bubbles. but seriously want one…. I, for one, salute our robot underlings. Oh man its a dream come true. How do I order one for work. I think my manager and team lead would not have a issues approving this. If the robot is THAT large and takes that long to get the beers out of the fridge why not make a ‘mobile fridge’ that comes to you? Off the top of my head I envision either a motor base from a wheelchair or some Harbor Freight drill motors (more likely the wheelchair motor due to weight) with a fridge + UPS and some sort of tracking setup. Line follow would be the easiest, but visual tracking could be implemented with enough time and money. Have it “park” to an outlet for normal fridge use and have it undock from the outlet temporarily (running off the UPS) to deliver your beer/food/etc and return itself back to the outlet/permanent home. Seems like it wouldn’t be TOO hard. But then you would need to dock your mobile fridge to the mains (230 AC). I think that would be a little dangerous for the DIY community. I mean, most simple DIY docking stations have exposed wires, LOL. Aztraph: Thank you for defining the human race as Europeans. HaD posting an article that casts a robot (an other wise gender-neutral robot) as a woman due to the fact that it is serving beer. This kind of comment shows the underlying sexism in the technical arts, and frankly the world is messed up enough without people who think that casually misogynistic jokes are funny. Please bring your standards back up to the level I’ve come to expect from HaD. Sam A: I do not classify the human race as Europeans, i mentioned the middle ages yes, and during that disease riddled era beer DID make a big difference, but the history of beer goes all the way back to ancient Egypt. do you think I define the human race as Egyptians too? No. I am merely referring to point in humanities past were beer was responsible for its survival, and of course to set ezekiel straight that beer is NOT the bane of humanity. @supershwa I would say programming a robot for this, is a help in general for programming robots, it does include a large range of tasks, that need to be perfected to get robots into more general use, so the more people ‘playing’ about in this field, the better.